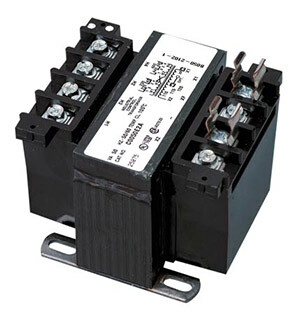 Transformers provide stepped down voltages to machine tool control devices enabling control circuits to be isolated from all power and lighting circuits. This allows the use of grounded or ungrounded circuits that are independent of the power or lighting grounds; greater safety is afforded the operator. The control transformer line is particularly adaptable on applications where compact construction is demanded. Determine the primary (source) voltage (the voltage presently available). Determine the secondary (load) voltage (the voltage needed at the load). Determine the load VA: Multiply load Volts x load Amps to get the VA rating. Select a transformer rating equal to or greater than the load VA. Note: Comes with instruction sheet.